David at Camp Colman, originally uploaded by The Bacher Family. David's 5th grade class spent three days at the YMCA's Camp Colman in October of 2008, and I got to be a chaperone. I took lots of great pictures over those three days, but this one is my favorite of David himself. 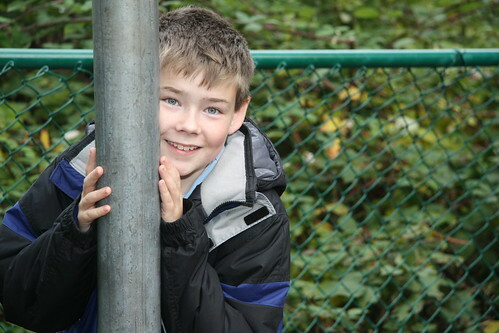 We were waiting for the buses on our final day of camp, and David ducked behind the flagpole, playfully avoiding my camera. When he peeked around, I snapped the shutter, and got this great portrait of him.